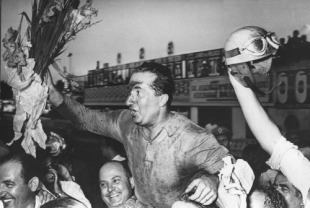 Alberto Ascari's win at the German Grand Prix six weeks' earlier had revitalised a championship that Juan Manuel Fangio appeared to have almost sewn up, and ensured a massive turn out at the Italian Grand Prix at Monza. The home fans were not disappointed as Ascari scored another victory and put him ahead in the drivers' standings. Both Alfa Romeo and Ferrari were constantly developing their cars and victory at their home grand prix would be an important prize. Re-doubling their efforts, Alfa fitted the 159 with an even more powerful supercharged engine which was rumoured give another 40bhp. Juan Manual Fangio put it to good effect in qualifying, his practice lap of 124.5 mph became the fastest yet seen in Europe. So it was not surprising that Fangio's Alfa, supercharger whining, went into an immediate lead with team-mate Farina behind him. But Alberto Ascari was on their pace and he was soon in a battle with Fangio with the lead changing a couple of times. Then Fangio threw a tyre tread which cost him 34 seconds. The two Ferraris of Ascari and Gonzales were in front and Fangio was using all his mastery to catch them but at half distance his engine blew. Unlike earlier in the season when he had commandeered Fangioli's car, there was no second chance as de Graffenreid's Alfetta was already out of the race. With only the best four results counting towards the championship, the title would go to the final round. Ascari led home a Ferrari one-two. Farina preserved a little honour for Alfa Romeo having taken over Bonetto's car. He lost time in a pit stop which went wrong and finished the race with a split fuel tank and fuel burning him. It was a brave third place. Villoresi and Taruffi were fourth and fifth while Andre Simon scored a rare point for Simca. BRM brought two V16s along but neither made the start. There was a final twist when Alfa Romeo fired several team members after it emerged its cars might have been deliberately compromised. Fangio's had been fitted with the wrong fuel filter, de Graffenreid's supercharger failed and Farina's fuel tank was damaged. For the British BRM team, fast becoming the sport's least funny joke, it was another wretched day as neither car was able to start. Prompting boos and whistles from the crowd. 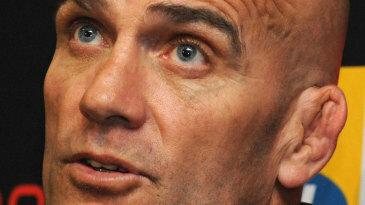 "It was too dangerous to let even one car run," explained team boss Raymond Mays. "The cars suddenly developed gear-box trouble." Even before then things had been a mess as the RAC refused to allow Ken Richardson, BRM's 40-year-old chief tester, drive the car because of his lack of experience.